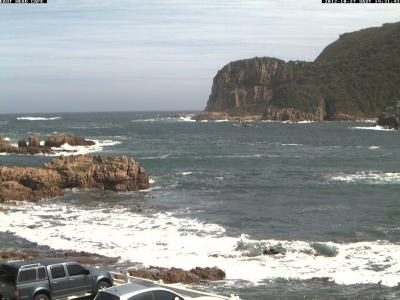 Safe and sound from "the heads" in Knysna! Canela just passed by The Heads in Knysna safe and sound and heading to Cape Town!!! One more hard pass to Canela's history!! Another glassy morning and a playground at chickens! From 6 to 8 am with just us 4 on the water! Paradise! Finally we got to the surf spots in Maldives. The first stop was in Cokes and Chickens and with a 2.5 feet swell thats what we got now imagine with 6. After seeing some of the northern islands, we got to this islands close to Male, the capital, where its more constant in this time of year. The water is impressively clear and warm, one of the most clean in the whole trip. Marine life as well. Amazing spearfishing but in the trolling we are having a lack of luck. Our inflatable is giving up. The pvc still good as the bottom, but the glue that they used wasnt the best i guess. Everyday we find some leaks cause the glue is not holding anymore. Today we got to the beach with the dinghy and after 30 min we came back and it was totally flat, so we thought was some joke but no, we found a big "unglued" section on the junction. So here we go number 1532 repair, maybe tomorrow number 1533. Thats how our life rolls, if it breaks, we fix. After filling up the boat with 300 liters of diesel, water, fresh fruits and vegetables, ice and last minute stuff, we took a shower at the Royal Yacht Club, where the fuel dock was, then left for our journey. The "check out" with the authorities was at the ferry terminal, which was strategically next to the club, about 300 meters. Kindly the staff of RYCL allowed Canela to wait for us at the dock. The paperwork here is one of the easiest in the world i believe. Matter of 15 minutes all done without any fare, both, the check in and out. A joke compared to the hard ones like Panama (the worst until now). Before we left, we started to film our departure. We bought a spare battery for our camera Nikon 3100, a generic one, and at "d" moment, the first try, did not work. We had to change at the last minute, for an original one, way more expensive. As always, the generic looks as good as, better price, but the thing is, a "Fifty Fifty", chance of working. So no record of that, and when we got one charged, we were far in the sea. We were all set, then asked the megayacht Vertigo's tender, which was droping some crew at the pier, to give a hand and pull the bow because it was a little tight and the wind was pushing Canela against the dock. The guy helped us with all his will and we left really smooth, the pier, saying goodbye to this land of many joys. Langkawi, if you come to Malaysia dont miss the opportunity to visit. The forecast showed that we had two days of light wind or no wind then when we had crossed the top of sumatera, the monsoons enter from north to northeast, varying between 10 and 15 knots. What happened was expected. We left with the wind against and 10 miles out, the forecast came true, with almost no wind and shifting. What did not show was the first night torrential rain and, precisely at midnight, on my watch, happened. Electric storm with thunders and lightning, strong winds and rain dripping with liters. I had to steer for 1:30 hours, almost all of my watch, because the autopilot gave up on me and we were still tunning the windvane, seeing nothing ahead and not being able to look up, because the wind was so strong that the rain drops hurted when it encountered my body and my eyes. Nothing much, just uncomfortable. Done with the squall, the next day were as expected, no wind and a lot of motoring. The crew took the day to put up on sleep and adapt to life at sea again. Late afternoon we started the construction of new speakers for the cockpit of the boat, since the old one surrendered after 3 years in singing almost 24 hours a day. Today, the third day, after a night that the sea looked more like oil than water, I was awaken by Bruno, for my watch, I made my stong black coffe, came up to the cockpit, then looked at the sea, and it still looked like oil, and I am presented with a group of dolphins, swimming with the boat. I went to the bow alone and there I was trying to communicate with these creatures so gentle and delicate. I think we dont speak the same language, but in we did look in each others eyes, and so much admiration from up here, because down there I do not know what they were thinking. Now i will continue with my watch until 10 am when i call Rasta for his one. I ate two slices of bread with honey and black coffee, as I said. Now an apple. After Canela’s refit, we are in final preparations for departure to Sri Lanka. Fine tuning and some maintenance that were left behind. We are servicing winches, checking cables, stays, mast, downloading the electronic chart for our navigation system (which is giving a headache, because the Internet is very unstable in these part of the word), and shopping for fresh fruits and vegetables, etc..
Malaysia (Langkawi Island, because we have not seen anything else) is sensational. Although we did not surf here, the whole crew enjoyed every minute. The population is very receptive and happy, the place is beautiful and, besides everything, is dutyfree. There are many tourists here. Do not know how we had not heard about this place before. When we thought about coming here, we were expecting a small island with not a lot of structure and that we would be here10 days maximum. We are already almost a month and not in a hurry, for the first time, we are not in a rush, or delayed. The waves season in the Maldives begins in April, so we have another 45 days to get there. 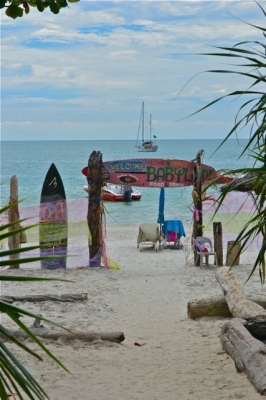 On arrival, we anchored on a beach called Cenang, just in front of Babylon, a bar that opens every day, with reggae band five days a week, where our kiwi friends were waiting for us for their farewell party, that extended for couple days. They left their boat, Rhumbus, to work for 6 months, save money, and then move on. Those were days of pure fun. I miss them. A few days after the departure of our friends, was my birthday. Many special people around me, a message from my dad on our site, which was cause for a tsunami of crying, many facebook messages from friends, a day of sunshine and joy .............. One of the best birthdays of my life, with several findings and definitions about myself. Everything was explained. Well, we lost another crew member, who left Canela to pursue his journey. Guile joined the crew in the Mentawais until Malaysia, fitting perfectly with the crew, awesome cheff and a not experienced, but a seaman by nature. Sad to have to let him go but happy to have had the opportunity to share great moments together. Guile, good luck to you. Now we are in 4. Me, my brother Augusto, Brunao and Rasta. The boat seems half empty, but it is a matter getting used to again. Actually it is more comfortable, but with fewer friends around, so I can say is a double-edged sword. All in peace on Canela, we will continue our journey, bringing and finding happiness to and from the world. I guess I am a very fortunate man.